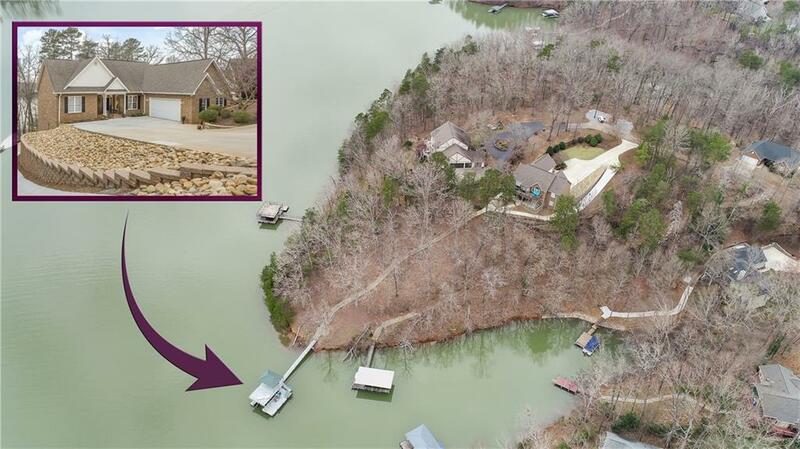 A RARE FIND...One of Lake Hartwell's BEST LOCATIONS by land and by water!! LAKE HARTWELL LOVERS...All homes have water now but if you want water all year long and no need to move the dock, you have found it!! Anglers...one of the best fishing spots just off the dock!!! This all brick home has 6 bedrooms. The main floor features 3 bedrooms, large family room, formal dining room, kitchen with breakfast area, laundry room, large deck, and 2 car garage. The lower level has a huge recreation room (44 x 20) with wet bar, 3 bedrooms, huge 2nd laundry room (10 x 15), climate controlled storage room, and a covered patio with a vinyl gutter system, Concrete walk to the covered double deck dock with roof no longer available on Lake Hartwell. The dock has power, water, and boat lift in place. The golf cart drive allows access from the front of the house to the dock. Western exposure with BEAUTIFUL SUNSET VIEWS. Hartwell Lake South Carolina is one of the southeast's largest and most popular lakes comprising of 56,000 acres of water and 962 miles of shoreline. It's the perfect lake for fishing, boating, and recreational sports. The gas log fireplace is not connected and has never been used.